It always feels good to have khabseys around – nice to eat and usually gives you the sense of something nice about to happen as they are usually made around the time of celebrations. But as my son says, why do we only make them on Losar or on special occasions, why can’t we make them more often. So saying, my son and his friend spend one afternoon making some .. and then eating some. 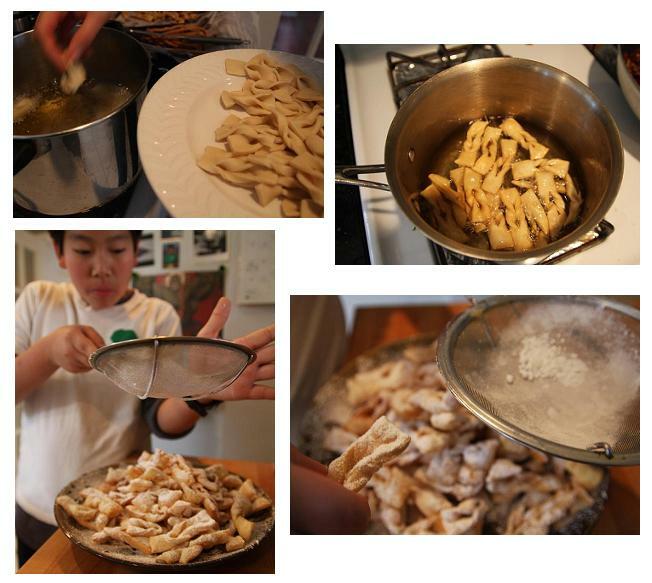 I helped them with deep frying … below is the recipe we used. I wrote this a few years back when his kindergarten class compiled a collection of favorite treats. 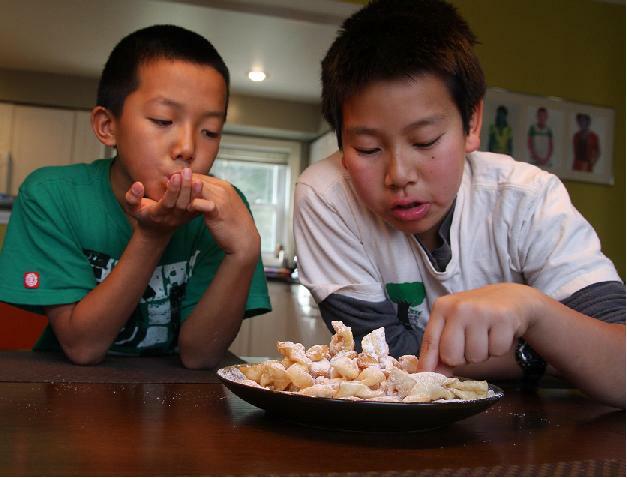 Khabsey’s are traditional Tibetan Cookies made in huge quantities during celebrations. We make Khabsey’s of different sizes and shapes. Some are as big as your arms spread out and some are tiny. Some are called ‘Donkey’s ears’ and some are called ‘Knot of eternity”. Here, we have made the most common hand twisted style. 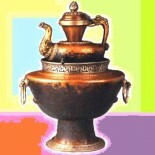 The word comes from the Tibetan word “Kha” which means Mouth and “Sey” which means eat. So its something to keep your mouth busy while you’re preparing for big celebrations and cooking many different dishes. In a large bowl, gently work the butter and salt completely into the flour. Then add water (a little at a time) to the flour and knead it for about 5 minutes till you get a smooth dough. Cover and set aside for ½ hour. 1. Divide the dough into 8 equal pieces. Form each into a ball. 2. Take the first ball of dough and roll out to a circle 9 inches in diameter. 3. With a sharp knife and cut the circle into ½ inch by 4 inch length pieces. Make a 1 inch slit in each piece. 4. Take one piece of cut pastry and fold one end in through the slit to make a twist. Do this with all your pieces. 5. Heat the oil in a fryer or deep pan to 325 – 350F, then fry the Khabsey till they are golden and crispy. 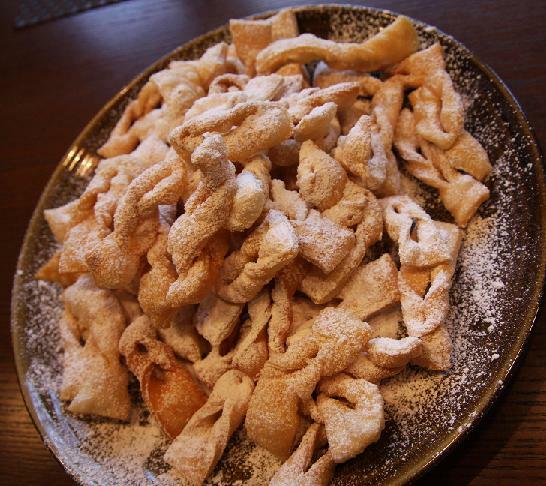 Drain on paper towels and sprinkle generously with powdered sugar when they are cool. 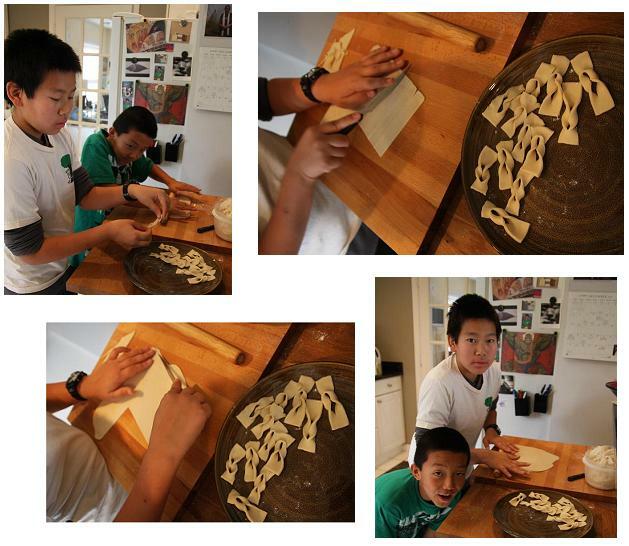 This entry was posted on January 8, 2012 by simplytibetan in Recipes and tagged khabsey, losar, tibetan cookie.